In the mood for a healthy sundae? Who can resist this all raw and natural sundae for breakfast or dessert? Feast your eyes, enjoy the creaminess and know it is all healthy! Using a blender, mix together the bananas, avocados and orange. In a separate bowl, mix together the cacao powder and honey. 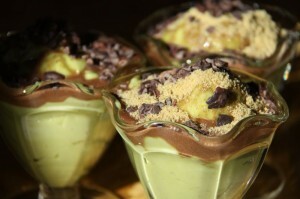 Alternately place the green pudding in a sundae glass, then the chocolate syrup, then another layer of green pudding and chocolate syrup. Sprinkle top with ground flax seeds and raw cacao nibs (or chopped up dried fruits). Carissa, a devoted wife and mother, writes for Mama In The Kitchen, she believes in raw, fresh, organic, local/in season, unprocessed food. Her passion is to educate other Mamas on how to create a disease-free, healthy life by adding more raw fruits and vegetables in their family’s diets. This article has been edited from a previous version published at Mama In The Kitchen.